Nearly indestructible…ideal for the campsite! You don't want your fine China anywhere near your campsite. But you also don't wanna deal with the mess and waste of paper or styrofoam plates. That's where the ultra-durable, infinitely reusable Stansport® Enamel Dinner Plate comes to the rescue! Kiln-hardened and campsite tough, we priced ’em low so you can get a whole set for your next trip to the Great Outdoors. 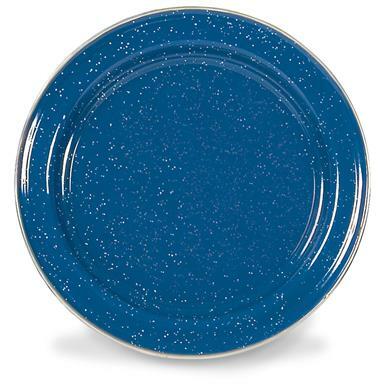 Stansport 10 Enamel Dinner Plate is rated 5.0 out of 5 by 1. Rated 5 out of 5 by ChiptheBarber from Good Stuff My wife had me scour the internet for these so I could make her bird feeders out of them. It finally dawned on me that this is right in SG's wheelhouse. So I checked and sure enough...$3 ea. Can't beat it. When they came in, I was impressed with the apparent quality. I kind of hate to make bird feeders out of them. They make me want to eat a bowl of camp stew out of them and sop it up with some bread. They look really good. 9" overall, weighs 8.8 ozs. Excellent all-purpose knife at a great price.